Ectopic pregnancy, which is also known as tubal pregnancy or eccyesis is an abnormality of pregnancy where the foetus is not implanted inside the uterus but in some other location outside of it. Many pregnant women, experience both the symptoms of vaginal bleeding as well as pain in the abdomen. Thus an early YSG is suggested in most of the cases. The pain may be described as dull, gnawing and sharp and it also causes cramps. Pain may also spread to the shoulder, in case of bleeding into the abdomen. Severe bleeding causes fainting, rapid heart rate and even shock. Persistent, severe and unilateral (one sided) pain is experienced in the abdomen. Vaginal bleeding is a different type of bleeding which takes place intermittently and has a dark red hue. These symptoms though different from normal menstruation, women may still confuse it with their regular periods. Is felt at the joint of shoulder and arm. The pain is felt while lying down and exact location of the pain cannot be comprehended. The cause of this pain is due to the stirring up of the nerve called phrenic. This nerve is present in the diaphragm and separates the chest from the abdominal cavity. The stimulation of this nerve produces the sharp, referred pain at the joint of the shoulder and arm. You may experience pain when passing urine or stools. These symptoms are common in ectopic pregnancy. These symptoms mimic the symptoms of a gastrointestinal disorder. Thus ectopic pregnancy is almost always accompanied with vomiting and diarrhoea. What is Shoulder Tip Pain During Ectopic Pregnancy? The shoulder tip pain during ectopic pregnancy is a severe associated symptom that is caused by triggering of a particular nerve. This type of pain suggests that the situation has worsened and you need immediate medical attention. This happens due to the bleeding in the diaphragm during the time of taking in and blowing out air. Due to this intense shoulder pain, you will also simultaneous feel sick and see signs of vaginal blood discharge quite often or may be continuously. This pain is felt exactly at the shoulder tip and not on any part of your neck or your back. The tip of the shoulder is the meeting point of your arm and shoulder and this type of pain feels like a strong spasm. 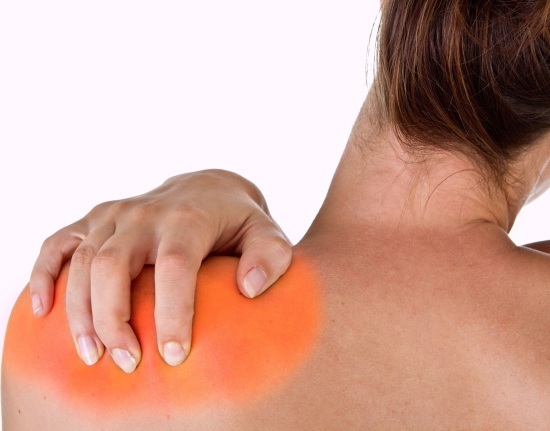 However, many mistake it to be muscle spasms; if this kind of pain happens due to stressed muscles or heavy shoulder work, it is not shoulder tip pain. During ectopic pregnancy, this pain gives you a severe, sharp and a very strange kind of a sensation. This kind of pain should not be associated with any similar pains of pregnancy as it happens only during ectopic cases. How to Deal with this Shoulder Tip Pain? You can take paracetamols, which are known to be safe in pregnancy provided you have not incurred any symptoms in the past during treatment with this medicine. You can also apply a cold pack to your shoulder for about 10 minutes as this will provide some relief.